William Robinson was born on January 19, 1923, in Chester, South Carolina. He enlisted in the U.S. Army Air Forces on June 25, 1942, and was trained as a Glider Pilot until April 1943, when he entered the Aviation Cadet Program of the U.S. Army Air Forces. He was appointed a Flight Officer and awarded his pilot wings at Williams Field, Arizona, on January 7, 1944, and then remained at Williams as a flying instructor from January to July 1944. His next assignment was as a gunnery instructor at Las Vegas, Nevada, from July 1944 to April 1945, and then as a flying instructor at Marana Army Air Field, Arizona, from May 1945 until he left active duty on November 24, 1945, having been commissioned a 2d Lt on May 17, 1945. Lt Robinson served in the South Carolina Air National Guard from November 25, 1945, to June 26, 1946, and then returned to active duty on June 27, 1946, where he took an enlisted position due to the military drawdown after World War II. MSgt Robinson served as an admin specialist and then as an Air Traffic Control Technician from June 1946 to March 1953, and was recommissioned in the Air Force on April 1, 1953. After completing jet fighter training, Capt Robinson served with the 430th Fighter Interceptor Squadron at Clovis and then Cannon AFB, New Mexico, from January 1955 to October 1957, and then with the 478th Fighter-Bomber Squadron (later redesignated the 478th Tactical Fighter Squadron) at Cannon AFB from October 1957 to July 1961. His next assignment was as an F-105 Thunderchief pilot with the 22nd Tactical Fighter Squadron of the 36th Tactical Fighter Wing at Bitburg AB, West Germany, from July 1961 to July 1965, followed by service with the 560th Tactical Fighter Squadron at McConnell AFB, Kansas, from August 1965 to May 1966. Maj Robinson next served as an F-105 pilot with the 388th Tactical Fighter Wing and the 13th Tactical Fighter Squadron at Korat Royal Thai AFB, Thailand, from May to December 1966, and then as an instructor pilot with the 3525th Pilot Training Squadron at Williams AFB, Arizona, from January 1967 to September 1971, during which time he served as commander of the squadron from September 1970 to September 1971. 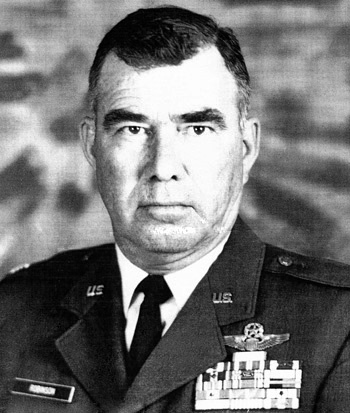 Col Robinson's final assignment was as commander of the 57th Tactical Electronic Warfare Training Squadron at Nellis AFB, Nevada, from October 1971 until his retirement from the Air Force on June 1, 1973. William Robinson died on February 9, 1988. Major William P. Robinson distinguished himself by extraordinary heroism in connection with military operations against an opposing armed force near Hanoi, North Vietnam, on 5 July 1966. On that date, Major Robinson, piloting a specially equipped F-105 Thunderchief, led a flight against hostile SA-2 surface-to-air missile sites which threatened other strike aircraft tasked to destroy a high priority target. With complete disregard for his personal safety, Major Robinson responded professionally in the face of continuous heavy and intense ground fire of all types and attacked four separate missile complexes. Three of the four sites were completely destroyed, and the remaining site sustained extensive damage. This courageous and aggressive action considerably reduced the missile threat against the other strike force. Through his extraordinary heroism, superb airmanship, and aggressiveness in the face of hostile forces, Major Robinson reflected the highest credit upon himself and the United States Air Force.